BEGi S6 on 99 NB. No comprehensive instructions. - Miata Turbo Forum - Boost cars, acquire cats. I am trying to install this damn thing using S4 instructions for a 99-05, S6 instructions for a 94-97, and coolant re-route instructions for a 99-05. They sent my kit with the instructions disk as a blank CD-R. I can't see how this is a packaging mistake, since the instructions for my kit DO NOT EXIST! Stephanie says she has to write them up. She has had since ******* MARCH when I ordered the kit to get that done. Anyway, using the cobbled together instructions I have hit a road block. The lower radiator hose inlet to the block is a replacement that keeps the lower radiator hose away from the turbo to protect it from heat. It has a hose barb fitting that is close to the same position as the fitting on the original block inlet for a small hose that comes off of the water neck for the upper radiator hose. The problem is if you put that hose back on that hose barb fitting it will rub on the power steering pump pulley and be mangled pretty damn quick. In fact, further on in the instructions it says to put a hose from the upper radiator hose water neck up to the water and oil distribution block... no ware can I find that it ever mentions that hose barb fitting on the lower radiator hose fitting on the block ever again. WTF is it for? I don't see how any hose can go on there and not rub the power steering pulley. Now, the BEGi coolant re-route instructions are just a pain in the *** when not integrated with the turbo installation. Turbo installation has various hoses re-routed already, and then the coolant re-route doesn't have "turbo and non-turbo" instructions... it just has generic instructions. There are a bunch of small pictures that show various parts in various places... but no overall diagram showing where everything goes in the system. Give me a diagram and I can figure **** out for myself... without a diagram I am relying on poorly written instructions. After looking at a diagram of the stock coolant routing, I think that the barb fitting on the new lower radiator hose mount is for the heater core return line. **** me if I can understand why they put it on top pointing towards the ******* power steering pump, instead of on the bottom where nothing is in the way. I may see if I can source a 90 deg fitting to replace that ****** with so it isn't pointed toward the power steering pump. If I am totally wrong on this someone please let me know. At this point I am totally frustrated. I didn't have any issues with mine until I deleted the ps pump. I couldn't figure out where the image was stored so I could show it here, thanks. I am now suspecting that a hose goes from that barb up to the water / oil distribution block. Still horrible placement of the hose barb if that is what it is for... how do you keep the hose itself from rubbing on the power steering pump pulley? Last edited by Twodoor; 08-23-2014 at 08:34 AM. BEGi, haha. It will all be custom when you get through. Just make it work. That piece is called the mixing manifold, for future reference. In stock form, there is a hose that goes from the upper water neck, to the mixing manifold. IIRC, it's BEGI's water source and return for the turbo. 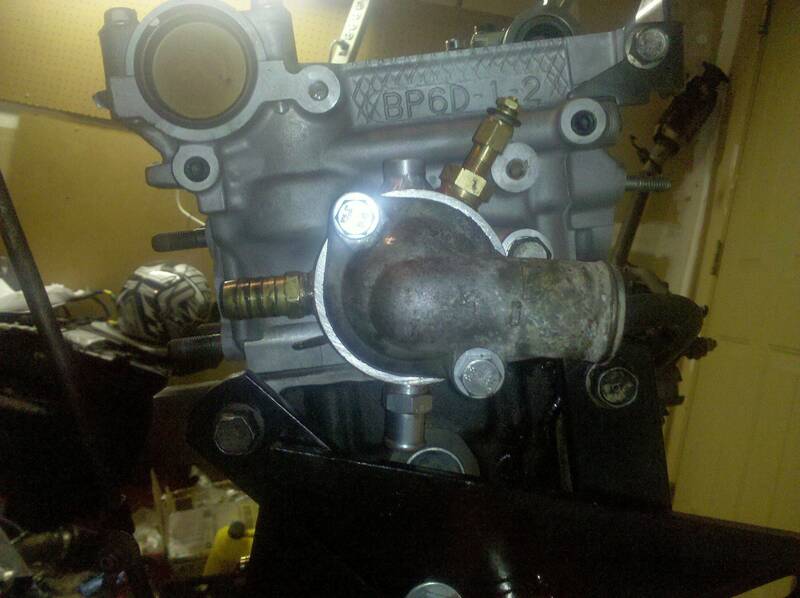 So a hose goes from the upper neck to the turbo, and the turbo back to the mixing manifold. Easy as that. There's no correct "in" or "out" to the turbo, so route it however makes sense. Generally the one pointing towards the block goes to the mixing manifold. In case you need for reference. Yeah, mine didn't have the barb fitting. Looks like I will have to buy one. Why did you use the 45 deg angle fitting with a plug instead of just the plug? It's sitting in my garage uninstalled at the moment. I'll end up installing a sensor anyway but I don't like the way it sits way down in behind the head. The fitting at least gets it up a bit so if I needed to replace the sensor I can get to it. Careful tightening the bolts! No torque spec and it's easy to crush the Kia part. Sounds good, thanks for the heads up on the water neck! Since my engine is in the car, I think I know why some people have leaks... took me hours to get all the old gasket off, using a mirror to check, wire wheel on my air driven die grinder, and razor blade scraper tool... What a pain in the ***! Lucky for me the stud was easy to remove on mine. You might use the barb that is in the mixing manifold in the thermostat spacer and use the angle fitting in the mixing manifold. That is how my spacer is my spacer is set up. The mixing manifold barb fitting is much smaller, I purchased the correct size fitting from Advance Auto. Should I use permatex RTV sealant, as specified in the instructions, or "Honda Bond"? I got a couple tubes sitting in my shop. Normally I would use thread tape on the threaded fittings and a thin coat of permatex on the gaskets, but I don't think thread tape stands up to high temperatures very well. Redo - 3 Builds for 5 years. Quick Reply: BEGi S6 on 99 NB. No comprehensive instructions.